The noble church of St. Mary, which is a landmark for the surrounding country, has always been with us and we are proud in being able to call it ‘Our Church’. Our Vicar was Canon Searl Ebsworth. He was well liked by his parishioners, also by many of the Nonconformists. He was a great worker and it was through his instrumentality that the church of St. Mary is what it is today. There was a succession of curates, Revs. Moxon, J. H. Green, Jowett, etc. Following the death of the Rev. Jervase Brown, George Searl Ebsworth (M.A. of Clare Hall, Cambridge) was vicar of St. Mary’s Church from 1842 to 1863. He was born on Christmas Day 1814, in Bethnal Green, London, the son of Thomas and Mary Susanna (nee Crook) and on July 5th 1843 was married to Sarah Mary Anne Cazalet, daughter of Peter Clement Cazalet and Olympia (nee Cazalet), at St. Nicholas Church in Brighton. 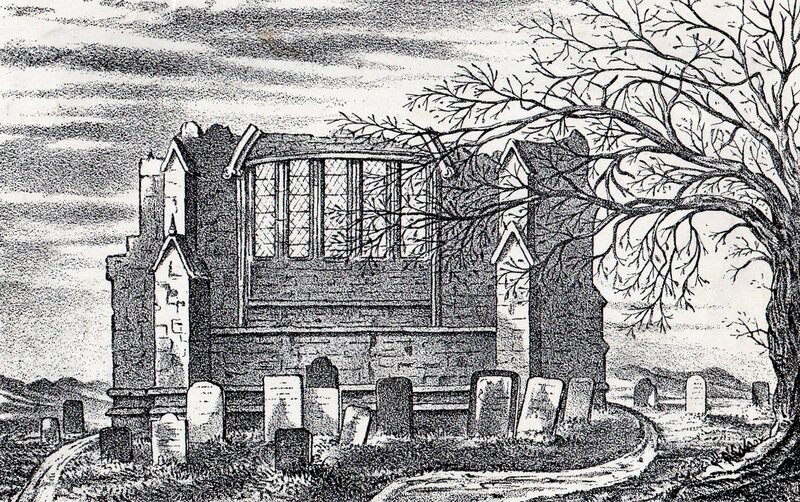 When George Searl Ebsworth arrived at St. Mary’s following posts at Hoxton in Middlesex and then Brighton, shortly before his marriage, he found the Ilkeston church in a very dilapidated state. In particular the chancel was in desperate need of repair before it fell down. 1843-1853: Property in need of renovation and improvement. 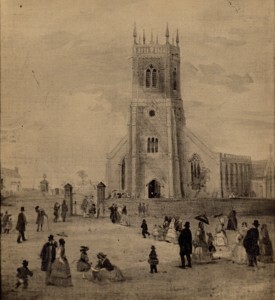 An east end view of St. Mary’s Church in 1840. (courtesy of Ilkeston Reference Library). Financial contributions were made and repairs undertaken but within ten years the condition of the church was again causing concern. “Not only was the interior unsightly and unsuited for the purpose for which it was set apart, but so damp and dilapidated as to prevent many of the parishioners from publicly worshipping in it”. In 1851 – according to the Religious Census of that year — the Church had 512 free sittings. Total morning average attendance was 400 with 150 in the general congregation and 250 Sunday school scholars. The corresponding afternoon figures were 500, (250 + 250). 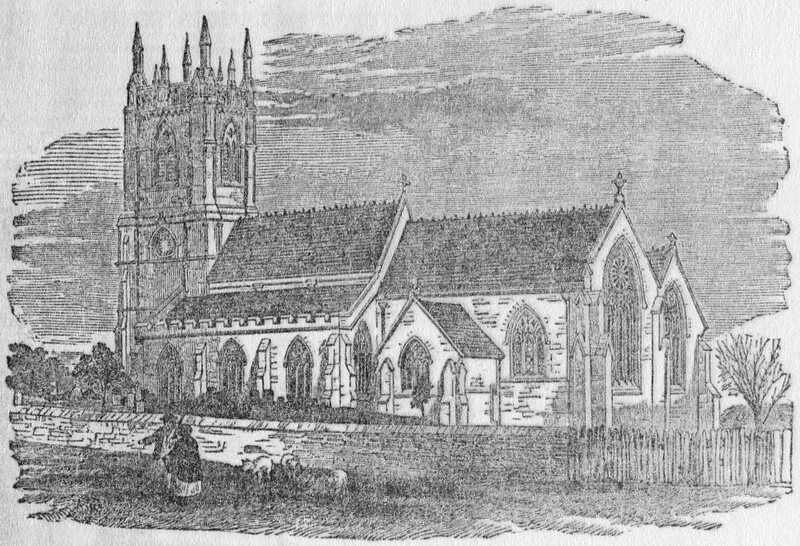 In his Derbyshire Church Notes, Sir Stephen Glynne described St. Mary’s which he visited in January 1852. “A large church with several interesting features, amidst much modern alterations and very bad internal fittings. It has a large chancel, nave with aisles and west tower and the chancel has had once a north aisle now destroyed. The tower and all the west end are modern and incongruous, having been rebuilt 1737. The south piers are octagonal with moulded capitals and semi-circular responds. Sir Stephen continued in similar detail to describe the rest of the church interior and exterior, including…. “The east window(in the picture above) is of an earlier** character and has five lancets surmounted by a large moulded arch, having clustered shafts to the outer arch”. (** earlier than Middle Pointed or Decorated period 1307-1377). The full description can be found in ‘The Derbyshire Church Notes of Sir Stephen Glynne 1825-1873’, edited by Aileen Hopkinson, Vincent Hopkinson and Wendy Bateman. (Derbyshire Record Society 2004). On October 13th 1853 vicar George convened a meeting in the National School-rooms in the Market Place at which plans for improving St. Mary’s were discussed. And Chairman George was the first to address the meeting. “For many years the church of this parish has been suffered to fall into a most deplorable state of decay. Since the year 1734, in which the ancient spire and one of the chancels fell down, and were replaced by the present tower and chancel, little has been done to keep up the fabric. So far however from regretting that little was done during those long years, I think, judging from the unsightly erections of that period, that we have every reason to rejoice that our ancestors withheld their hands, and left us to perceive much of the beauty and admirable design of the original structure, which might not have been the case, had they modernised the building. “But … many a crumbling mullion, and many a decaying rafter, tells its tale of coming dissolution, and … unless we thoroughly restore this house of God, we shall have more serious accidents than those which have alarmed us of late years”. He then proposed a resolution, calling upon those present to join him to begin a serious fund-raising campaign and finance a through restoration of the church. West Hallam-born writer Thomas Rossell Potter, who had travelled from his Wymeswold home to lend his support, out of his love for the church, spoke to second the vicar’s plea. “My heart sinks to think of the wretched state in which this temple of God has been permitted to lie waste. You have here a noble building, with its beautiful sedilia, its exquisitely proportioned arches, unequalled in the Midland counties, its unique stone screen, its high Norman arches communicating with the south aisle, in a state which would disgrace the hut of the humblest mechanic among you. The beauties of the fabric are hidden under the whitewash accumulation of generations of churchwardens, who have no idea of repairing a church beyond covering it with filthy lime. Your pews are like railway trucks, sentry boxes, or pens for sheep; they are good only for enabling one lady to examine another’s shawl and dress. They must all come down; your galleries must come down…. 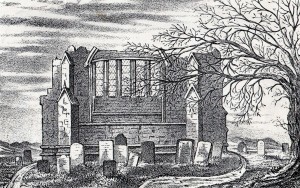 “When we see Ilkeston church in its present state – when we see a board in what was once a most beautiful window – a disgrace to my own house, as it would be to the house of any man: when we see whitewash, cobwebs, and dirt thickly covering the most beautiful carving, it is a sight enough to make a good man’s heart sad”. Others present added a chorus of support and contributions of nearly £450 were pledged immediately. The fund was started which was to eventually raise £4000 to pay for the extensive building work which began in February 1855. The works were to be executed by Messrs. Lindley and Firn, builders and contractors, of Leicester. 1855: The church is renewed. In March of 1855, when digging the foundations for the new chantry chapel on the site of the old one, workmen removed a solid wall, six feet deep below the surface and six feet wide, below which was a bed of hard solid clay. As they dug this out they came upon a partially decayed ancient oak coffin containing a human body, only slightly decomposed, with flesh still on its bones. It was carted away to elsewhere in the churchyard where it was re-interred with appropriate decency. In November 1891 a letter appeared in the Ilkeston Pioneer written by ‘Kensington’ in which he commented on these Church ‘improvements’…. The old tumble-down church was restored about 35 years since, and the (church) yard was extended, taking in a piece of waste ground where rubbish used to be deposited. Wasn’t there a row about it ? But the Vicar was one too many for his detractors, and the Market-place was improved. The ‘row’ referred to in this letter — which surfaced in March 1855 — centred around extending the present, overcrowded burial ground in front of the church building onto land, originally part of the Market Place — and thus much closer to the population as they went about their daily life. Concerns were raised by some about the ‘health of the town’ suffering as a result, while other residents argued that the appearance of the Market Place would be spoiled — perhaps forgetting that the annexed land was at present being used to house waste and ‘other nuisances’ ? The old church wall was replaced by a new one, further to the west of the original — some residents looked around for someone, (anyone !! ), to blame for this ‘unauthorised’ intrusion. However it was pointed out that the land in question was not public land, owned by the inhabitants of Ilkeston, but was private property, previously owned by the Duke of Rutland but given to the church for the purpose to which it was now being put. The foundation stone to mark the church improvements was laid in the north-east corner of the chantry on Monday, April 8th 1855. Mrs. Ebsworth inserted a plate-glass box containing coins of the year into the stone, together with an account of the restoration and enlargement of the church, of the day’s ceremony and of the names of the building committee and the subscribers. To mark the occasion a service was held at the Girls‘ National School which had been licensed for public worship during the rebuilding process. A service of Reconsecration on Thursday, October 18th 1855 saw the re-opening of the church for divine worship. The morning trains from Derby, Nottingham, Mansfield and Leicester brought eager visitors to swell the assemblage. 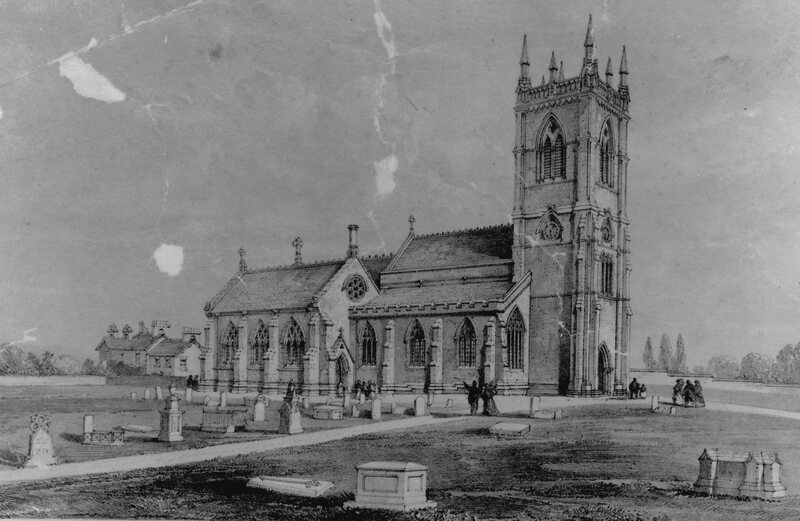 In November of 1855 the architect Thomas Larkins Walker presented to the Leicestershire Architectural and Archaeological Society an historical account of St. Mary’s, compiled by himself, together with a lithographic print of the church made from his recent restoration designs. “The peculiar features of interest in the Church consist of the south arcade of the nave, which is a very good example of transition from Norman to early English; the western arch which is pure early English; the chancel which is a transition from early English to decorated; the aisles which are pure decorated, and the south arcade of the chancel which is a transition from decorated to perpendicular. This arcade originally separated a chantry from the chancel; about a century ago the chantry, which had fallen into disuse, was taken down, and a wall built against the beautiful arcade. This chantry Mr. Walker has rebuilt from his own designs, and has given entire satisfaction to the most severe ecclesiastical critics. When the then Earl of Delewarr (or Delawarr or Delewar!!) learnt of this he agreed to pay for the ‘repatriation’ of his ancestor’s effigy, and Messrs. Lindley and Firn were to undertake that work. And at the beginning of 1858 the Pioneer reported that Lord De La Warr (another alternate spelling !! ) and Cantelupe’s beneficence had borne fruit. “In the restoration of this monument the most eminent antiquarians have been consulted. They advised that the effigy should remain in its mutilated state, with one or two slight exceptions; but that the pediment should be restored to its original state, since sufficient remained to give a clear indication of what it once was. The manner in which the work has been done, and the correctness with which every detail has been followed, reflects the highest credit on Messrs. Lindley and Firn, who have shown themselves not only workmen but men of good taste”. In the spring of 1856, funded by public subscription, an additional alteration was undertaken when the church’s Italian tower was transformed into an early English one. This involved the replacement of the tower’s pinnacles – according to the Nottingham Review, built with the tower 76 years previously – by entirely new ones. The changes were again designed by Thomas Larkins Walker and completed by Messrs. Lindley and Firn. P.S. No scaffolding was used during the making of these alterations and no human being was injured!! In 1879 J. Charles Cox published his fourth and final volume of “Notes on the Churches of Derbyshire” which “deservedly places its author and compiler amongst the foremost ecclesiastical historians of our time”. (IP June 1879). It contains a chapter on St. Mary’s Church and is far from complementary about the restoration of 1855. Extracts from “Notes on the Churches of Derbyshire”. Vol. 4. (Chapter on Ilkeston). The church underwent a thorough, and, in many respects, most unfortunate “restoration” in 1855*, when the outer walls of the north and south nave aisles were taken down and rebuilt ; and the tower, west end of the aisles, south chancel vestry, and north chancel aisle built new, but on the old foundations. The tower, beneath which is the principal entrance to the church, is a pretentious affair, but singularly poor and bald in all its details. A glance at the carving of the capitals of the shafts in the jambs of the west doorway is sufficient to prove the character of the work. The vestry on the south of the chancel is said to be built on old foundations; and Sir Stephen Glynn(sic), who was here three years before the restoration, remarks that “the priests’ door south of the chancel is set curiously sideways within a large exterior arch, as presented externally.” It would therefore appear that there was also at one time a south chancel chapel. In a pamphlet, issued when the restoration of the church was in contemplation, it is said that there was originally a sacristy on the south side of the chancel. But sacristies are hardly ever found on that side of the chancel, and no such building would require a large archway opening into it. The lofty arcade of three arches that divides the nave from the south aisle is specially interesting, being of the transition period from Norman to Early English, about the time of Richard I. The pillars are circular, and the arches, which only just partake of any pointed character, are ornamented with the chevron pattern and an outer moulding of the nail-head device. The arcade between the nave and the north aisle is supported on lofty octagonal pillars with plainly-moulded capitals, and is of decorated date, but early in the style. The windows of both the aisles are also of that style, circa 1300, but were rebuilt in 1855. The old patterns were not very carefully followed. The spacious chancel is also of good Transitional character, of the last quarter of the thirteenth century; but the alterations of 1855 were here also apparently of an unnecessarily extensive character. At the east end of the south aisle is a small piscina niche. In the north wall of the north aisle, near the east end, is a shallow sepulchral or founder’s recess, quite plain. “The font,” says Sir Stephen Glynn, “has an octagonal plain bowl, upon a raised base and kneeling step.” From Mr. Meynell’s drawing (made in 1814), we judge it to have been coeval with the south nave arcade. In 1855, this font disappeared, and we have not been able to trace what became of it. The one now in use is a modern effort, with a good deal of carving about it. The taste or reverence of those who would substitute a new for an old font, however plain the workmanship of the latter, is not to be envied. Against the south chancel wall is a row of three sedilia, and a double piscina. There is a remarkable stone screen, dividing the chancel from the nave, having five cinquefoiled, arched compartments, with pierced quatrefoils in the spandrels, and grey marble shafts, of circular form, with moulded capitals and bases, the whole resting upon a stone wall. The doorway occupies the centre arch, and has its shafts rising from the ground. This screen has been repaired at various times. The mouldings of the capitals and bases of one or two of the columns, which are original, appear to be of Early English character, but the general style of the workmanship and the details of the tracery show that it is coeval with most of the chancel work, viz., at the beginning of the Decorated period. It has been thought by some that the marble shafts were not originally designed for the screen, but have been removed from older window jambs ; but we see no reason for such a supposition, which would be entirely contrary to the use of medieval architects. Mr. Meynell also makes mention of two brass plates to Francis Gregge, gentleman, 1667, and to Robert Gregge, gentleman, 1680. “The church having undergone some alterations the above monuments of the Gregge family are removed, but the brasses are in the possession of the clerk.” Where are they now? He further mentions several more modern inscriptions that cannot now be found, concluding with the remark “These appear to be all the inscriptions now remaining, but many are removed and lately destroyed.” The destruction of monuments in this church certainly seems to have been peculiarly wanton, even for Derbyshire. In the vestry is an oak parish chest, the carving on which shows that it dates from the Perpendicular period. On the Holy Table are carved the words : ” Ex dono Thome Harrison, qui obiit Octobris Anno Domini 1622.” (donated by Thomas Harrison who died October 1622). The registers, according to the Parliamentary Return, begin in 1586, but are defective between 1670 and 1679. *The Pioneer was unhappy about the use of the word ‘unfortunate’ and sprung to the defence of the ‘restoration’. “The old Church was so thoroughly decayed and unsafe in many parts, that not only was a thorough overhauling of the whole building necessary, but it had in effect to be entirely re-built, and then it became almost impossible to retain its ancient appearance intact, either internally or externally”. 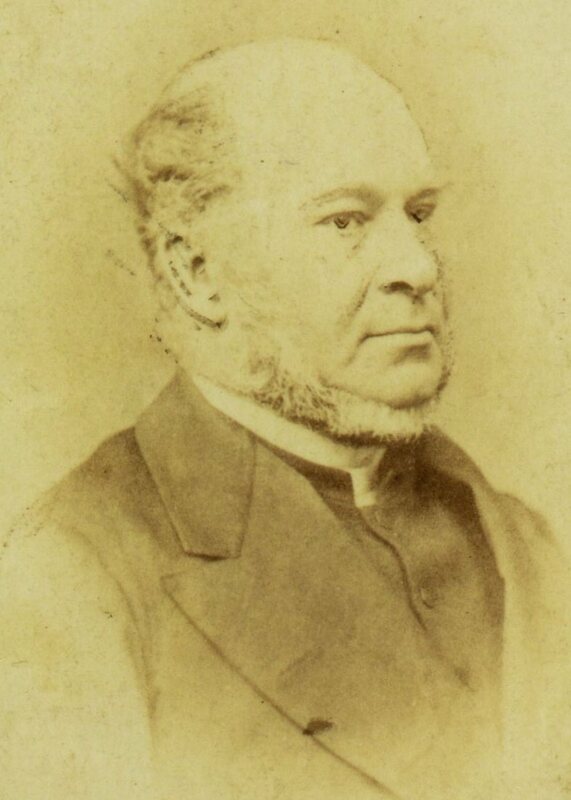 Another defender of the old church – as you might expect — was George Searl Ebsworth, who by 1879 had left Ilkeston and was now Vicar at Croxton Kerrial near Grantham. The day after J. Charles Cox’s book had been reviewed in the Pioneer, George wrote a letter to the same newspaper, which was printed the following week. “Sir, — I think it will be satisfactory to the parishioners of Ilkeston to be assured that the restoration of their Parish Church was carried out in the most conservative spirit. Nothing was pulled down which could with safety be allowed to remain. The greatest care was taken that the minutest details should be faithfully reproduced. To this end the architect and a very competent assistant spent fourteen days in taking measurements and forms of the mouldings, &c, previous to making the plans. The north aisle walls fell down when the roof was removed. The foundations of the chantry walls and of its buttresses were discovered three feet under the surface, and the new chantry was erected upon them. The arcade separating the chancel from the chantry was about two feet out of the perpendicular. As it was taken down each stone was marked, and afterwards restored to its place. “The marble part of the screen was copied from pieces found in the old wall which had been built up to preserve the upper portion, which is of Ancaster stone. “It is to be regretted that want of funds prevented the tower from being completed according to the first design, which was admirable. The present work was determined upon by the churchwardens, who could not bear to see the shabby Italian tower when the rest of the Church was restored. “ I think it due to the memory of the architect, Mr. Larkyns (sic) Walker (pupil of the elder Pugin, and continuator of his architectural works), that these facts should be known. I am quite prepared to vindicate every part of the restoration for which Mr. L. Walker was responsible; he was a man professionally in advance of his time, and many of his suggestions – received coldly when put forth – are now adopted by our best architects. I am, Your obedient servant, G. SEARL EBSWORTH, Late Vicar, from 1842 to 1863. Writing in his ‘Jottings’ column of the Ilkeston Pioneer (December 30th 1932) ‘Rambler’ referred to this painting. “I have before me a picture of St. Mary’s Church on a summer’s evening, with the parishioners wending their way to church, painted in 1856. It is the more interesting because the figures represent well-known townspeople of that day. A local lady to whom the picture once belonged knew whom the figures represented. Unfortunately she never committed a list to paper and as she paid the debt to nature many years ago, it is not likely now that they will ever be known. In the apparel of these old Ilkestonians tall hats, poke bonnets, crinolines and parasols are prominent. Several of the boys are sporting ‘toppers’. Raising the hat was a custom in 1856, as at least two of the figures are showing this courtesy. I believe that the original painting is held at the Erewash Museum. A north-west view of St. Mary’s Church 1856, from a litho print published by John Wombell. At Christmas in 1856 vicar George was at the Butter Market (or ’Town Hall’) with his churchwardens and parish officers distributing cloth and flannel to the poor of Ilkeston provided by Gisborne’s charity, set up in 1817. (See the Alms Houses and Ilkeston’s Charities). On the scene appeared lace manufacturer Joseph Bailey, a Guardian of the poor of the parish to oversee the process and ensure that the presents were given out without favour or bias — but the vicar’s Christmas spirit seems to have deserted him and he took exception to this intrusion. In previous years his deeds had been misrepresented by the Guardians and he wasn’t going to allow that again. He wanted Joseph to leave his room and called for the constable to remove him. Joseph was not a man to be trifled with however, and stood his ground, warning the constable to ‘be careful’. The vicar was also determined and ordered Joseph’s instant removal, promising to support the constable in his action both now and in the future. Joseph was then ‘collared’ out of the room. 1863-1894: The Rev. George’s post-Ilkeston days. George left Ilkeston in 1863 for the vicarage of Croxton Kerrial near Belvoir Castle and was succeeded by James Horsburgh. When the former left, on behalf of the parish Dr. Norman presented him with a silver dessert stand, consisting of a figure of Autumn, 20 inches high, with leaf and tendrils of vine in its hands, standing on wheat ears. N.B. The departure of George was bad news for future genealogists. In the Parish Records he had almost always recorded the date of birth of any child brought for baptism (as well as the baptism date). That convention was not followed by the next vicar. 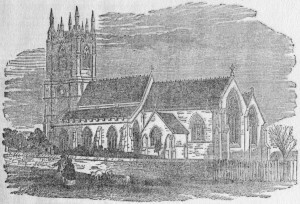 Mr Ebsworth made one of his several return visits to the town in April 1866 at the opening of the organ in St. Mary’s Church — the Rev. Horsburgh had been called away to Herne Hill, Surrey, after the death there of his only surviving sister, Jane Frances, the wife of Lieut-Colonel James Horsburgh MacDonald, late of the Bengal Artillery. And in June 1879 the Rev. Ebsworth was making another ‘guest appearance’ at St. Mary’s Church. Still evidently very popular among his former congregation, the attendance at the morning service was large but the church was packed in the evening. The space before the Communion Table and the pathways of the aisles were full. George Searl Ebsworth died at St. Leonards-on-Sea on October 30th, 1894, aged 79. He was buried at Church-in-the-Wood at Hollington, Sussex, close to his home at Holly Bank, Hollington Park.